Camp de concentration de Tarrafal is part of the Tentative list of Cape Verde in order to qualify for inclusion in the World Heritage List. From the perspective of Praia, the capital of Cape Verde, the town of Tarrafal is located exactly on the opposite side of the island of Santiago. Although the distance is only 60 kilometers, it can take as long as 1.5h by car and even up to 3h by minibus, called here aluguer. We chose the latter, adding to the adventure. You have to ask the driver to stop near the camp, which is in the outskirts of the town of Tarrafal, near the main road. The Camp was founded in 1936 in the times of the exemplary Catholic, dictator of the Portuguese empire Antonio de Olivieira Salazar and functioned (with a 7-year break) until April 25, 1974, the memorable day of the Portuguese Carnation Revolution. The location was not accidental, because at that time Tarrafal was the real end of the world - the islands were completely isolated, but at the same time they were almost in the middle of the empire, at the junction of sea routes. The nearest neighborhood was rarely settled, and most importantly, the water sources were extremely scarce and easy to control. Therefore, escape was very difficult, hence there were no such cases in the history of the camp. 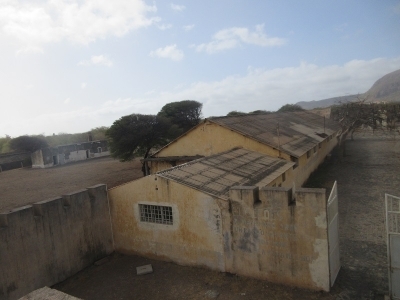 Tarrafal was a place of isolation of the opponents of the regime from all over the empire - except for the Portuguese, independence activists from Angola, Mozambique, Guinea-Bissau and Cabo Verde itself were also imprisoned here. In the camp, basically, everything was designed to make the prisoners' lives uncomfortable - from isolates warming up to 50 degrees in the sun, to purposely infested food served in the local kitchen. Through all this, Tarrafal deserved the name Camp of Slow Death (Campo da Morte Lenta). Although modeled on Nazi camps, Tarrafal was definitely less deadly - for so many years of functioning, "only" 32 prisoners did not survive it, and after 1948, there were no deaths at all. The camp infrastructure has survived to this day in a good condition, although almost nothing but the walls have been preserved inside the buildings. There is also scant information about the functioning of the camp itself. Maybe it will change before the official nomination (now postponed until 2020) although one may wonder if (and why) places like this should be inscribed.